Troy Lindner of Los Angeles, Calif., weighed a five-bass limit totaling 19 pounds, 6 ounces Saturday to win the EverStart Series Western Division event on Lake Havasu with a three-day total of 15 bass weighing 49 pounds, 11 ounces. 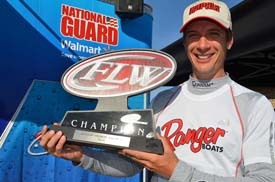 For his victory, Lindner earned $29,665 and a Ranger Z518 with a 200-horsepower Evinrude or Mercury outboard motor. ?Honestly, this doesn?t feel real at all,? said Lindner. ?I?m in shock. Coming in today in ninth place, I figured I would need 21 pounds to even make it close. I thought I basically had no chance. It?s a complete miracle I won this thing. My last nine tournaments with FLW, I haven?t cashed a check, so I took some time off and got my head and priorities straight. I think that preparation and a blessing from God is what did it for me today. ?I fished a lot of the small coves and the points leading into those coves,? Lindner continued. ?I was using Trigger X baits for most of the tournament. My two biggest fish were caught on a Trigger X Aggression Spadetail worm and a Trigger X Flutter Worm. I was catching fish from 3 to 15 feet, basically wherever it banked off deep. The last part of the day, I sat an hour waiting on this one fish on a bed that I thought was a big one. Every 15 minutes I would go back and make a couple of casts at him. I finally got him to bite on the Spadetail worm, and he ended up being my second biggest fish of the tournament. I had about a dozen bites today, and was able to catch seven of them. ?I?ll definitely be fishing the next event at the (California) Delta,? Lindner went on to say. ?I?ve been beaten pretty bad there in the past, so if I could cash a check there that would be another miracle. ?Rounding out the top 10 pros were:2nd: Chris Kinley, Durango, Colo., 15 bass, 49-9, $10,1713rd: Joe Uribe Jr., Lake Forest, Calif., 15 bass, 49-5, $8,4764th: Terrence Rath, Lake Havasu City, Ariz., 15 bass, 49-4, $7,628,br>5th: Michael Tuck, Granite Bay, Calif., 15 bass, 48-4, $6,7816th: Michael Wright, Grass Valley, Calif., 15 bass, 45-14, $5,9337th: Jeff Michels, Lakehead, Calif., 15 bass, 45-0, $5,0868th: Jimmy Savoini, Prescott. Ariz., 13 bass, 41-12, $4,2389th: Brian Ankrum, Loveland, Colo., 13 bass, 39-10, $3,39010th: Duane Dunstone, Reno, Nev., 14 bass, 36-5, $2,543Jon Griffith of Mesa, Ariz. caught the biggest bass of the tournament in the Pro Division Friday ? a 6-pound, 6-ounce bass ? that earned him the day?s EverStart Series Big Bass award of $234.Kyle Baker of Lancaster, Calif., won the Co-angler Division and a Ranger 177TR with an Evinrude or Mercury outboard motor and a Ranger Cup bonus of $5,000 with a three-day total of 14 bass weighing 35 pounds, 14 ounces.Rounding out the top 10 co-anglers were:2nd: Tony Zanotelli, Redding, Calif., 11 bass, 32-9, $3,9513rd: Richard Crine, Anaheim, Calif., 12 bass, 32-4, $3,5124th: Allen Todd, Gardnerville, Nev., 12 bass, 30-7, $3,0735th: Vic Allen, Canyon Lake, Calif., 11 bass, 29-4, $2,3646th: Nick Nourot, Benicia, Calif., 11 bass, 27-11, $2,1957th: Dante Ray, Reno, Nev., 11 bass, 26-4, $1,7568th: Travis Moran, Reno, Nev., 8 bass, 25-1, $1,3179th: Lonnie Foster, Kneeland, Calif., 8 bass, 23-8, $87810th: Daniel Leue, Colusa, Calif., 6 bass, 17-14, $702William Penrod of Salome, Ariz. caught the biggest bass of the tournament in the Co-angler Division Friday ? a 5-pound, 11-ounce bass ? that earned him the day?s EverStart Series Big Bass award of $156.The EverStart Series consists of five divisions ? Central, Northern, Southeast, Texas and Western. Each division consists of four tournaments and competitors will be vying for valuable points in each division that could earn them the Strike King Angler of the Year title along with $5,000 for the pro and $2,000 for the co-angler. The top 40 pros and co-anglers from each respective division will qualify for the EverStart Series Championship that will be held on the Ouachita River in Monroe, La., Nov. 1-4.The next EverStart Series Western Division tournament will be March 29-31 at the California Delta in Oakley, Calif, and is hosted by the City of Oakley.For complete details and updated information visit FLWOutdoors.com. For regular updates, photos, tournament news and more, follow FLW on Facebook at Facebook.com/FLWFishing and on Twitter at Twitter.com/FLWFishing.